Julie, you have a powerful way with words. Words that need to be said and heard throughout not only the Catholic Church, but the enter world. The innocence of our children is a blessing. Thank you for bring their voice! 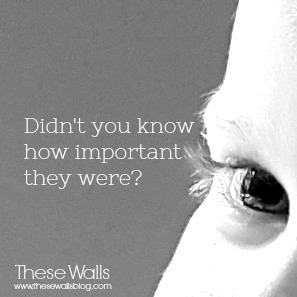 I like the idea of the past tense here: didn’t you know how important they were. I pray that it is truly in the past because I worry that you might need to use the present tense: don’t you know how important that are! I’m so suspicious now. So much cover up, so many lies, so many, many involved. How do I know it’s in the past only? Well said. Perhaps the ultimate sin is to abuse the innocent. I have lost all faith in the church leaders. They are no better than gangs or members of crime syndicates, protecting their own at the expense of the most vulnerable. How very poignant, Julie! Hope you don’t mind me sharing. These atrocities can NOT be ignored any longer….for the victims.